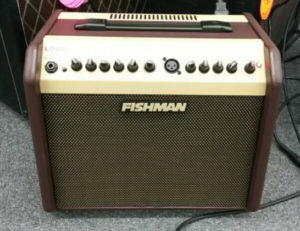 The Fishman Loudbox Mini acoustic guitar amp. Geepers, this is one of the smallest amps in the shop, but it sure packs a punch. Huge sound! I was blown away! 60 watts, 2 channels (one for instrument, one for mic), each with individual reverb controls, and a seperate chorus control on the instrument channel. Phase switching and master volume. This would be great in a cafe or pub. Plug in a guitar and a mic, no need for a PA. The reverb is very natural sounding, sounds lovely. This amp can get plenty loud without distorting. A serious amp in a tiny package. $850 RRP. This entry was posted in Advice, Amplifier, Guitar, Shop. Bookmark the permalink.